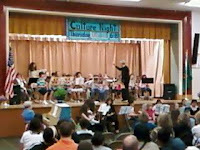 Kayleigh performed in her spring concert tonight. She's in advanced band after only a year and a summer of prior instruction, a consummate clarinetist. The program was all over the road, from the beginning students doing the requisite Twinkle Twinkle Little Star to the advanced string ensemble doing some really nice arrangements. 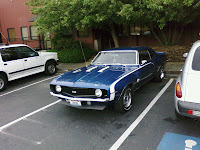 Ooh, and look what we saw in the Subway parking lot on our way to school... sweet ride, no? I hate to think how much the owner is paying for gas right now, but it's beautiful nonetheless. I thought it was funny that the license plate says TRUBL, and I was wearing my TROUBLE FINDS ME T-shirt. More drama with Tyler. I'm so tired of it. I'm sorry Tyler's trying your patience. Some kiddos will hit that brick wall a gazillion times before they realized the stinkin' door is RIGHT THERE. I have one of my three boys (my 10 yr old) that seems to always pick the road more...bumpy. It wears you down after awhile. Just keep in mind they push most the ones they know aren't going anywhere. Hope it lets up soon! Almost forgot---congrats to your daughter :) It sounds like she's shining along! Thanks for your steady readership and support, Nix. I appreciate the check-ins. All the best to you and your three... good lord - THREE. How do you do it? Yep, three boys. Brandon's 14, Trevor's 12 and Ryan's 10. They certainly keep me busy and when they're grown, my house is going to be so...quiet. I learn that you earn more patience by practicing it, not that I'm always successful! Congratulations to Kaleigh. Bask in the glory while you can - something's gotta make up for all the cleaning up, nagging, patience stretching tongue biting that you do! Your issues with Tyler won't last forever - it'll just seem like it while you're dealing with 'em! Wishing you wisdom and endless patience.